Because females control more than half of the purchasing decisions in their homes, Hallmark Inc.did some research on this target market-women. Qualitative research revealed the importance of girlfriends in the life of women. A national telephone survey was conducted asking women ages 18-39 how they first became acquainted with their girlfriends, and how often they kept in touch with their girlfriends. Respondents were asked to rate how likely (or unlikely) they were to share secrets, surprises, disagreements with spouses, and personal (pregnancy) information with their girlfriends. The results showed that 45 percent of women felt that there was an occasion on which they would rather share the information with a female friend than a male friend. It was also found that 81 percent of women “calmly discuss topics when they have a difference in opinion with their girlfriends.’: Both of these percentages illustrate a higher probability for females to share information and engage in correspondence. Personal interviewing methods may be categorized as in-home, mall-intercept, or computer assisted. In personal in-home interviews, respondents are interviewed face-to-face in their homes. The interviewer’s task is to contact the respondents, ask the questions, and record the responses. In recent years, the use of personal in-home interviews has declined due to its high cost. Nevertheless, they are still used, particularly by syndicated firms such as Media mark Research, Inc. (MRI). 1. First, an in-home interview is used to collect demographics and data related to media exposure (including magazines, newspapers, radio, television, cable, Internet. and outdoor). 2. At the end of the interview, the fieldworker leaves behind a self-completing questionnaire booklet covering personal and household usage of some 500 product categories and services and 6,000 brands. Fieldwork is conducted by LHK Partners Inc., Newtown Square, Pennsylvania Each fieldworker is thoroughly trained in interviewing techniques as well as in methods of gaining access to respondents and establishing rapport. 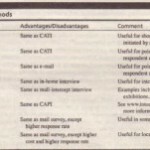 A wide range of techniques is used to elicit the full cooperation of respondents. Listed households are informed by mail ahead of time that they will be contacted by an interviewer. 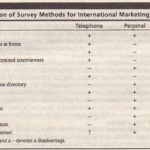 Up to six separate attempts are made to contact difficult-to-reach respondents. Households presenting language barriers are reassigned to specifically qualified interviewers, as are refusals and other unusual cases. The personal interview takes. on average, 60-65 minutes to complete. At its conclusion, the questionnaire booklet is presented and a $20 payment is offered as an incentive for its completion. The interviewer then makes an appointment to return at a later date to pick it up. In mall-intercept personal interviews, respondents are intercepted while they are shopping in malls and brought to test facilities in the malls. The interviewer then administers a questionnaire as in the in-home personal survey. The advantage of mall-intercept interviews is that it is more efficient for the respondent to come to the interviewer than for the interviewer to go to the respondent.f This method has become increasingly popular and there are several hundred permanent mall research facilities. As the following example shows, mall intercepts are especially appropriate when the respondents need to see, handle, or consume the product before they can provide meaningful information. Computer-assistedpersonal interviewing(CAPl), such as that using touchscreens,is becomingmore popular aroundthe world. However. before data collection can begin, the respondents need to be at least hr. identified. Therefore, an initial task is to obtain a valid mailing list. Mailing lists C.II compiled from telephone directories, customer rosters, or association membership roll, purchased from publication subscription lists or commercial mailing list cornucopia- Regardless of its source, a mailing list should be current and closely related to the populous of interest. 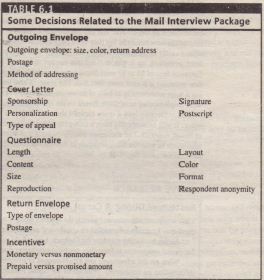 The researcher must also make decisions about the various elements of the mail interview package (see Table 6.1). Mail surveys are used for a variety of purposes. include; measurement of consume~ preferences, as illustrated by the following example.